What’s your favorite color? Chances are, there’s a way to work it into your home’s roof in a way that expresses your personal style and improve your home’s curb appeal. 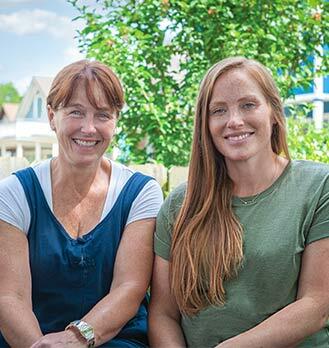 Each week, mother and daughter remodelers Karen E. Laine and Mina Starsiak inspire HGTV’s “Good Bones” viewers with their colorful home transformations. 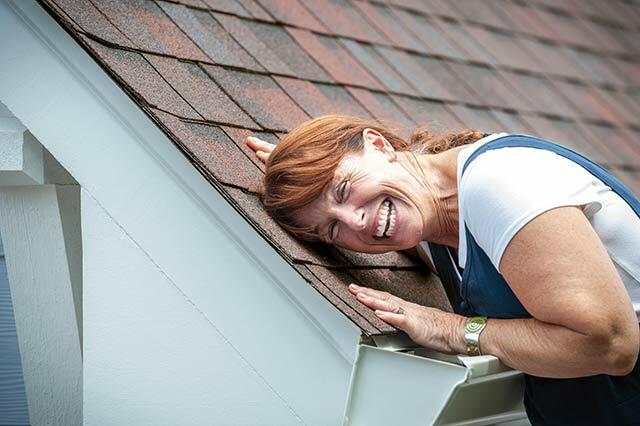 Karen and Mina, founders of Indianapolis-based Two Chicks and a Hammer, have used Owens Corning® TruDefinition® Duration® Designer Shingles in televised remodels and even on their personal remodeling projects. Below, Karen and Mina get “personal” about color and how the right shingle color can boost a home’s curb appeal. What’s an easy way to integrate color into a home’s exterior, including its roof? (Mina) Putting together an exterior mood board is one way to make the right decision for you. One of our first steps is designing a mood board or style board. How do you start building a mood board? (Karen) Look around your house and find the items that appeal to you. It might be a lantern, a piece of pottery, a decorative planter... whatever. Once you’ve gathered these items, look for what makes them inspiring. Is it a color, pattern or some other common theme? These things can serve as permission pieces for the rest of your home’s exterior. What do you mean by a permission piece? (Karen) In design, a permission piece allows what might otherwise be disparate components to live together happily. Think about a beautiful rug with a vibrant color woven in. You might pull that color out through different furnishings in the room, such as your curtains, chairs or accessories. The rug serves as the permission piece for all the items to live together. The same concept applies to a home’s roof. The nice thing about the Owens Corning TruDefinition® Duration® Designer shingles is they can serve as the permission piece for your siding, front door, or patio furniture. The shingle is the unifying piece that lets all these pieces talk to each other. What other advice do you have for building a mood board? (Mina) Look at your collection holistically because what you put with the roof shingles is going to change how it looks on your house. How do you select colors for the home exteriors on your show? (Karen) Above all else, color is really personal, but certain colors tend to evoke feelings. A bright sunshiny yellow says “happy” and a nice greenish blue shade conveys a sense of calm, while red is very vibrant and energetic. On our show, we remodel 13 homes every season, so we try to include some variety and use colors that pay homage to some aspect of the home. When we work with a homeowner we help them think about color in terms of how it makes them feel. I might start out by asking a homeowner what colors speak to her. But I’ll also ask her to look at other houses in the neighborhood. No one wants their home’s exterior to fight with the neighbor’s house. Above all else, color is really personal. Certain colors also evoke feelings. What tips do you suggest when it comes to using color specifically on the roof? (Mina) Consider a couple things. Do you want to blend in or stand out? Also, do you have any (neighborhood HOA) rules you have to follow. One thing they can’t dictate is the items you put on your porch. You can still get very personal, fun and colorful with your porch light or your front door or the pillows you put on a chair. Have you used Owens Corning’s colored shingles in some of your projects? (Karen) Yes, but we didn’t realize the role color could make in transforming a house until we’d been at it a while. On our first home rehab we used an orange roof and I can’t tell you how many times we’ve wished we could have a do-over on that house. When we saw the subtle, multi-dimensional colors embedded in the Owens Corning TruDefinition® Duration® Designer shingle line, our eyes were opened to how color could be a big part of the exterior redesign. 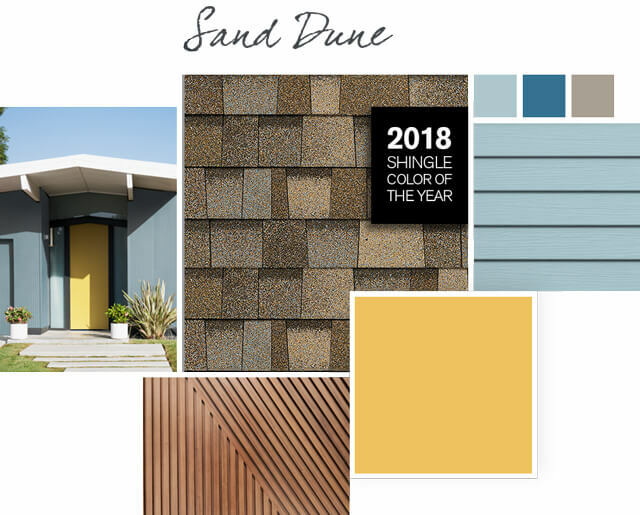 We put the Sand Dune shingle on our home office roof – we call that our “Mermaid House” - and it changed how we think about roof color. The roof is a subtle element that can have a really big impact. You don’t top off a home with a new roof and say, “Wow, that’s an amazing roof.” Instead you say, “that’s an amazing house.” The roof makes the whole house stand out in a very positive way. Do you suggest homeowners use technology to guide their exterior color decisions? (Karen) Well, I like to start with the physical shingle. I tell homeowners to hold the shingle next to their home’s paint or siding. That will give you a gut instinct of whether the color works. Then, use Owens Corning online visualization tools to digitally place the shingles on the whole house. That provides a way to double-check you’ve made the right decision. How can homeowners use the tools Owens Corning has made – such as the online design and inspire style boards - to inform their roof decision? (Mina) You can find a look you like and say this is really great except I want to go even bolder with my accent color; or I actually want to tone it down a bit. That will at least give you some ideas with the different shingle options and the direction you’re going to go in. What advice do you offer a homeowner prior to meeting with a contractor? (Karen) Think about the colors you like before the contractor comes to your home. Otherwise, there’s a good chance that the contractor will show up with a limited range of exterior options. Also, consider your budget and the extent of the re-roofing project. If you can afford to do a complete exterior overhaul, use the roof as that permission piece to tie everything together. If you can’t afford to do a complete exterior rehab but need to replace your roof, select a shingle color that contains some of the hues you want to work into your home’s exterior when you can afford to make more extensive enhancements. And remember, color is personal. Don’t let a contractor, your neighbor or your friends make the color decision – the final decision should always be yours. (Mina) You want to take what you’ve done inside your home and make it match on the outside. So, every time you pull up, you’re super happy. You feel like this is me and I can own it and really be proud of my house. How has your partnership with Owens Corning changed how you think about color on the roof? (Karen) The colored roofs we looked at in the past were really one dimensional and flat. The orange roof on our first remodel stands out from the rest of the house. Owens Corning has created color shingles that are subtle and variable in shade. The roof is a critical component of a home’s exterior design. The right color can complement a well-planned new exterior or pull together disparate exterior elements. "It's no secret that we love using color in and on our homes. 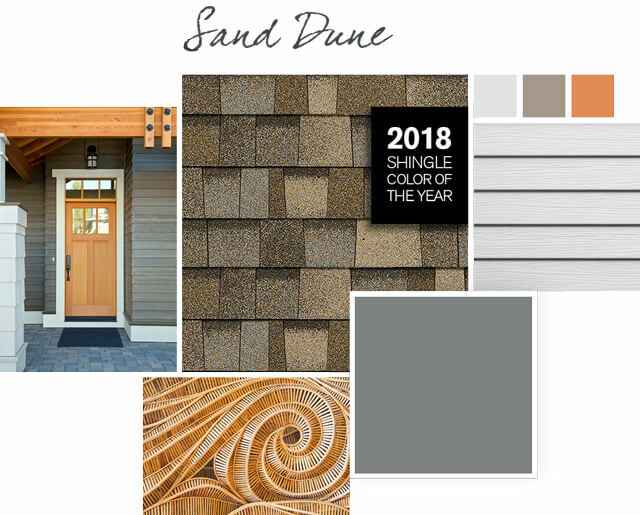 We've used Owens Corning® TruDefinition® Duration® Designer shingles in Sand Dune on our home office and think the color is light and approachable. We think it's great that Owens Corning selected it as the 2018 SHINGLE COLOR OF THE YEAR. 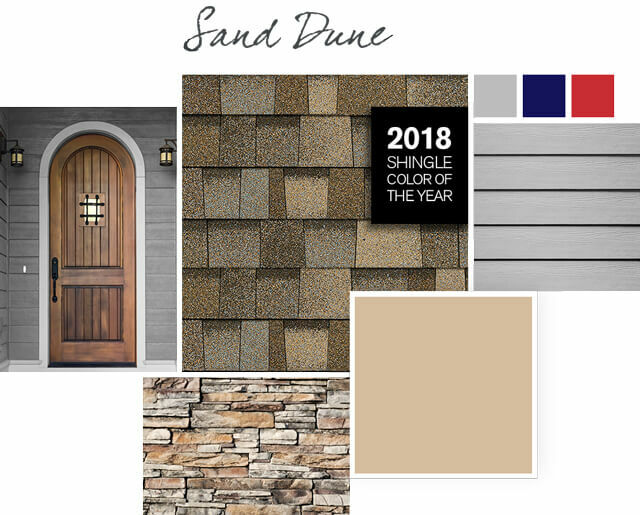 We are honored to collaborate with them to bring you a few dream boards that showcase the versatility of Sand Dune with various exterior palettes." Karen E. Laine and Mina Starsiak are Two Chicks and a Hammer, Inc. Follow Two Chicks and a Hammer on Facebook and Instagram as TwoChicksandaHammer, on Twitter and Snapchat as Twochicksindy, and on Pinterest as Two Chicks and a Hammer/Good Bones.